We would like to welcome you to our new website! We invite you to take a closer look at what GVI could mean for you. We are proud to present our latest project: the construction of several residential towers at multiple locations across London! See the photos above to get an impression. We are currently looking for a number of talented installers for this enormous project. Work activities are primarily located in Veldhoven, the Netherlands. See the VACANCIES/RECRUITMENT PAGE below and contact us today! Over the years, GVI has grown into a tried-and-tested company of installation and facade professionals. By working closely together with the most progressive Dutch aluminium facade builders, we have had the honour of realising several beautiful projects in both the Netherlands and Belgium. Today, GVI is alsoworking overseas. 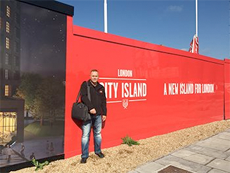 Currently, GVI is working on a number of magnificent projects in London: London City Islands and Royal Wharf! Take a look at the following links to get a better impression! We are involved in closely-knit collaborations as one of three long-standing partners participating in this project. Within this group of partners, one party supplies the prefab sandwich concrete elements, another party supplies the window frames and glass panels and the third party in the group takes care of the installation and the project management for our major client in England! This project will continue throughout the coming years. These ready-made concrete prefab elements are manufactured in the Netherlands (in Veldhoven) and are transported by lorry and ship to London. The ‘dominoes’ will be stacked on-site to create stunning residential towers in the heart of London!